Whew! Just in time for Halloween its time for the top 5 Scooby Villains of all time. How’s that for timing. As scary cartoons go, Scooby Doo was the tops. Great color pallet, dark storylines, and lots and lots of fog. I am of course referring to the original “Scooby-Doo,Where Are You?” Series, not the “The Scooby and Scrappy-Doo Show”, and although Phyllis Dillar was very scary in “The New Scooby-Doo Movies”, it just didn’t inspire the creepy mid afternoon terror of a good old skool Scooby Doo Mystery. So in honor of Halloween I put together my top 5 Scooby Doo Villains. Lets start the countdown. Enjoy! The Black Knight is from the very first episode of Scooby Doo and he is pretty creepy. One of the more famous villains because he appears in the opening credits of the show the Man from Mars is one of those rare villains who it turns out is not human. Killers robots are pretty darn scary. Not as frightening as a ghost or a vampire, buts its up there. You better believe it. When a robot wants you dead it will do it more efficiently then any poltergeist. Spectres are scary right. I have no idea what a spectre is, but it seems to be some kind of ghost and in this case a headless one. I am not sure why a Spectre who is headless is scarier then a headed ghost, but it is. The Phantom is not only a creepy ghost, but their are two of him. Thats right in this episode you get two Phantom Shadows for the price of one. And of course like all mysterious phantoms, it plays the organ. To this day I still hear him in my sleep. “Watch the pretty coin of gold and you will do what you are told…” The Ghost Clown was the villain in the episode called Bedlam in the Big Top. I remember that episode name because it sent chills coursing through me whenever it came on the TV. Of course you could take anything that is scary and to make it scarier by just adding a clown. On the scary scale of 1-10 clowns rate a 64 and a Hypno-Clown rates off the chart. Do you have a favorite Scooby Doo villain? Post a comment and share it with the world. Enjoy 1970’s Disneyland Showtime With Kurt Russell! Sticking with the spirit of the Season – it’s hard to top The Haunted Mansion ride, especially when it’s vintage 1970 footage from the Disneyland Showtime episode featuring Kurt Russell! i was born in ’89 but watched these with my dad every morning. An amazing list of the greatest scooby doo villans. im actually watching the Black Knight episode right now. The “Where Are You” series had so many classic characters. The witch and zombie in the swamp, the alien in the abandoned air field. Great list brought back alot of memories. Welcome to the site goode. I am glad this list triggered some good memories. I myself am a huge Scooby Doo fan. I just love everything about the series. The stories are fun, the characters are great and its got a color pallet that is just amazing. Next Halloween I think I will work in some more Scooby Doo related stories, especially if I can complete my DVD collection before then. Welcome to the site scoobied. I totally agree about The Spooky Space Kook – I can still hear that laugh in my head. Damn maybe he should be in the top 5 – its was a hard list foe me to make and he is definitely up there. we should have a photo of every scooby doo episode. i like these photos they are very good. Thanks Evan and Denni. I am a big fan of the art of Scooby Doo myself and if I had the time I would love to do a character guide. I will put then that on the “To Do” or “To Doo” list. thats gd 2 hear and y dont i change it 2 top 10? 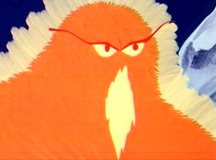 My girlfriend doesnt believe me that there was an “electric” orange monster in Scooby Doo, i distinctly remember being petrified of it as a kid!!! All I can remember is it made a buzzing kinda noise, and was glowing orange……of course, all the gang solved the mystery in the end….! Hi Glen, your remembering the 10,000 Volt Ghost! He was one of the ghosts I remember being scared of when I was a kid. Great site Retroist, maybe you could change the list to a top 10 to get in a couple more of the more memorable creeps? I totally agree with the list, but love to see the werewolf, the space kook, the skeleton men, 10000 volt ghost and Tiki Witch Doctor up there as well. It’s really to hard to pick though. So many classic spooks! The monster that scared me most as a kid was the Cat Creature. The thought that a cursed medalion could turn you into a monster gave me many sleepless nights! i always thought that the no-faced zombie was the scariest.he has haunted my dreams for years. Ghost Clown and 10,000 Volt Ghost are my favorites, with the Phantom Shadow a close 3rd place! Nick, glad to see we have some overlap. MY FAVORITE SHOW ( just___where are you? Where’s Captian cutler, tar monster, 10,0000 volt ghost, zombie, but mostly captian cutler! I am glad to see we have some overlap Ernest. I think I picked the Ghost Clown because I had a strong love/hate relationship with that episode. I used to get creeped out by the technicolor ice cream phantoms…but that didn’t stop me from watching that episode with the lights off! The phantom shadow and no-faced zombie are creepy, too, and so is the ghost clown esp. when he rises up out of the bushes. Well for me it was Elias Kingston. I used to get chills whenever the opening came on with the music and his mansion with one light. First time I saw him I was scared every nite for the next 3 months. I still need at least one light on when I watch that episode. I have been watchting Scooby with my daughter and during the opening there is an orangish red monster skiing..he also comes out of a file cabinet and tries to get scooby. I cannot find the title for this show. It is not the Snow Beast or the Snow ghost. Can anyone help? 1. Headless Horseman – when he came riding out of the dark after “obtaining” a head from Cousin Elwood, all glowing and painted up with that evil laugh! The scariest ones for me were Witch McCoy, Dr. Coffin, Milo Booth, Ebenezer Crabb, the Snow Ghost, the Jaguaro, Elias Kingston, the Skull Island Vampire, the Ghost Werewolf, the Puppeteer, the Catwomen from Zombie Island, the Ghost Clown, the Demon Shark, the Caveman, the Freak, the Creeper, Alison Maye, the Phantom Truck and the Gnome. No way– The Phantom Shadow (who influenced how I drew ghosts for the rest of me life) followed closely by the Man from Mars (those vacant empty eyes of his… eesh! The only villain that may come close to the scariest of all on this list would have to be the Headless Spectre. I will admit that when I was a kid, it creeped me out a lot to see a man’s severed head in a box. But the absolute scariest villain without a doubt is the Cloaked Cavalier from Backstage Rage! The way he moved everywhere without raising a single alarm and the way he would appear in one place then disappeared when you turned back…I can’t even describe how much that scared me as a little kid. To this day when I think about it, he still gives me a slight shiver. “The Ghoul, the bat and the ugly” – This episode is chilling! It was a devil looking creature called the Shadow Creature which can levitate objects and he moves and speaks really freaky! “When you wish upon a star creature” – The star creature talks really freaky! “Twenty Thousand Screams Under the Sea” – This creature also talks freaky but he is more stalkish. He follows the gang everywhere which gives you an added sense of danger. “I Left My Neck in San Francisco” – Great episode where actually one of the gang could be the culprit! This episode is really clever and they give you a few clues along the way on who it could be. This character again also decides to follow the gang everywhere. “Strange Encounters of a Scooby Kind” – Great artwork and storyline. I would say that the Phantom Shadow should be number one. Otherwise, great list.